Not sure if your email campaign is successful? This post will cover 9 Email Marketing mistakes you should avoid. Email Marketing can be a highly effective tool if it’s used properly and to its full potential. But there are so many missed opportunities in emails being sent out from companies who don’t see the importance in taking the time to plan and develop a strategic email marketing plan. Many of these companies are guilty of committing at least one of these 9 common email marketing mistakes. Don’t squander the opportunity your email database offers you. 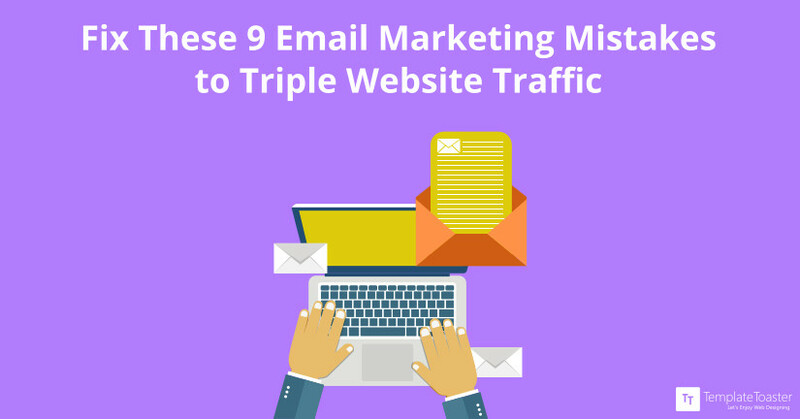 Fix the email marketing mistakes you’re making and watch as your website traffic soars. You’re going to have groups of customers who are different from one another, so who will require different types of messaging. Whether you’re targeting new customers or repeat customers, the focus for each will be different. Sending out the same message to everyone doesn’t give off that personal feel. And, for those who are customers, continually receiving messages offering them promotions for the first time customers can get a little tiresome.Here at Templatetoaster website builder, Let Mail Chimp help you divide up your email database, making it easier to send targeted messages to each group and to make your overall email marketing campaign better. No one likes spam. You should be aware of the fact that 21% of email recipients report email as “spam”, even if they know it isn’t. So even though you’ve gotten permission from your customers to send them emails, they aren’t expecting you to fill their inbox. In fact, if they feel as though they’re being spammed, they’re going to drop off your email list with a bad taste left in their mouth about your brand or company. Think how many emails each person receives per day. With so many email marketing campaigns and messages coming in, you’ve got to make yours stand out. Ditch the generic cookie-cutter message, and inject some unique personality into your writing. Find your brand voice and let it be heard. Make sure your messaging and voice are consistent, with a little proofreading help from Essay writer. When you do this, you’ll see that customers will connect with what you’re saying because it has an authentic voice behind it, rather than a robotic, generic voice. You can be funny, witty or even a little cutting edge when appropriate. But your messaging always needs to stay professional. No matter if it’s within your email message, on your social media or in responses to customers, you must always take the professional road. This means no swearing, no trash talking, and no picking fights. There are less obvious ways of showing professionalism also, including having messaging that’s been proofread and error-free. It appears completely unprofessional to send out an email message riddled with spelling mistakes. Get a professional to look through your work before you send it to your customers. Big Assignments has a team of experts ready to edit your work for you. Every company hires email marketing professional as it wants to convert every single email into a solid sale, but that’s not going to happen. Setting realistic targets for yourself means you have achievable milestones to work towards. Your goals have to be specific, measurable and should have a target date. Simply saying you want to ‘increase conversions’ is a general goal that lacks specificity. Increasing conversions by 10% are something that is measurable and specific. Sure, the message may be great, but if your emails aren’t great to look at, you’ll lose readers quickly. They want to open an email message and see something exciting and engaging. So, don’t disappoint by sending boring, bland or just plain ugly emails. This is one of the most common email marketing mistakes. TemplateToaster, a web design software is a great resource for pre-designed email templates that you can customize to suit your brand. And, always test out the look of your emails before you actually send them. Missing images, broken links or other display issues can seriously impede the number of people who will want to read it. Litmus helps you create emails that will look great on any platform they’re being viewed. The importance of the subject line cannot be stressed enough. It’s what is going to help someone decide whether they’re clicking to open your email or dragging it to the trash bin. For your email marketing strategy test out different subject lines to see what works best. Even though the message inside the emails may be identical, the effectiveness of the subject line will dictate whether one message is opened and one isn’t. If you’re stumped on what to use for a subject line, get some help with copywriting from Oxessays. A message doesn’t have to be long to have relevant and important information in it. If you’re promising a bombshell of information, but then throw flower petals, your readers will not be happy. You’re asking them to take the time to open a message and read it. So first, you need to take the time to compose a message they’ll want to read. Some writing assistance can be found through Academized if you’re looking for help on adding some meat to the bones of your message. When you need to reference other sources of information, Cite It In is there to put together perfect citations for you. One of the greatest resources you’ll have is the analytical data from your emails. Don’t ignore what it tells you because the numbers are important for your email marketing strategy. If something isn’t working, it will be evident in the data. Likewise, if something is working well, you’ll be able to see what that is and use it even more. Information like open rates, click-throughs, and bounce backs are all important things to know when you’re putting the time and effort into organizing and running a proper email campaign. Mail services, like Mad Mimi not only help you send and share messages, but they provide you with feedback on how your messages are being received. Following the email marketing rules and not making the mentioned above mistakes will bring more traffic to your website easily. Gloria Kopp is a digital marketer and a business consultant from Manville city. She is a regular contributor to such websites as Engadget, Studydemic, HuffingtonPost, and others.